In the investment world there is a research firm named Dalbar. They’ve done tons of research on what has come to be called “investor behavior.” If you have an investment account, you’re the type of person Dalbar has researched. Many in the investment world have come to rely on the Dalbar studies to explain why you should use an investment manager. I’ve followed their reports with a great deal of interest for years. Here’s what I’ve learned. Investors consistently do less well than the markets. The Dalbar studies show that investors consistently do less well than the markets. The conclusion of their studies is you likely do less well than the market because you buy high when you think things are going well and you sell low after fear has taken hold of your emotions. If you’ve ever had a conversation with a friend about being scared by the markets after a downturn or told your significant other that you need to get into a hot stock when things are going well, you fall into this category. I know I have and I bet you have also. Instead, if you act like experienced, successful investors you’ll realize you should be scared when the market is hot and excited to buy when the market falls. Better yet, just keep investing and let the market do what it’s going to do. This is the advice our friends at Vanguard give. They have proven that those who stay the course do way better than those who try to time when to get in and out of the market. Then there is how we actually measure market return. You must remember that when we talk about market returns, we talk about what a basket of indexes has done. These indexes have no costs attached to them. No fund costs, no advisor costs and no trading or platform costs. All of these add up. They could be as low as .5% and they could go higher than 2.5%. Even if you have really low cost funds, and you completely track the market, you’re going to under perform by at least a little. The problem is the Dalbar studies show that investors often do less than half as well as the market. So, if you’re not getting reasonable returns the cause is probably you and not the costs you’re paying for your investments. For most people investing is based on emotions. The reason you might not be getting returns that you read about in the financial press is because your emotions get in the way. It’s really hard to stay the course when the world seems to be falling apart. It always feels like it’s different this time. You might feel that if you don’t get out when your investment drops all of your money might disappear. The problem with this is you and I never really know when the market is going to turn around. If history is any guide, when the market looks like it’s at it’s worse it’s been a historical time to buy. History has certainly proven that it’s not a great time to get out when things look really bad. Don’t let your emotions get in the way. Learn to stay the course. This reminds me that we should talk about behavioral finance. I’m a big fan of the study of behavioral finance and economics. This is where psychologists study human behavior as it relates to money and money decisions. One of the biggest issues that rears its ugly head when it comes to investor behavior is what’s called recency bias. This is a fancy term that just means that we tend to pay a lot more attention to what’s happened in the recent past than what’s happened historically or what is likely to happen. This is why when the market goes down you think it’s going that way forever. When the market is hot, you believe that there is only way for the market to go. You can’t under estimate how important this is. 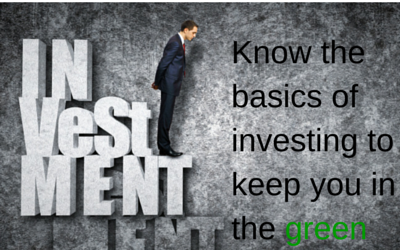 Not paying attention to your investments on a daily, weekly or even monthly basis is a good idea. If you’re investing for something that’s going to happen five, ten, twenty or more years from now what happens this month or quarter or even year isn’t going to make a big difference in your final outcome. Research shows that staying the course is what great investors do and what is likely help you reach your goals. Now it’s time to circle back to why investment managers help with getting you a better return. We’re here to help you understand the history of the market. We’re here to talk with you when the market isn’t behaving the way you want. We’re also here to help you not get too excited when the market heats up. Successful investing comes down to discipline. If you have great self-control an investment manager might not be important in your life. I know that I get a great deal of value when I have someone I can talk with when I get over excited or scared. And, that’s what we’re here for. If you’ve been disappointed with your long-term returns you just might get some great value from finding an investment manager who will talk you off the ledge. It’s a role I play with business owners and it’s a role I play with my investment clients. I think it’s the most valuable service I provide. What do you think?